Michelle Obama appears on the NBC Today Show's celebration of The International Day of the Girl in New York. Philly's Questlove is telling the story of Michelle Obama's life through music, crafting a three-part playlist inspired by the former first lady's new autobiography, "Becoming." 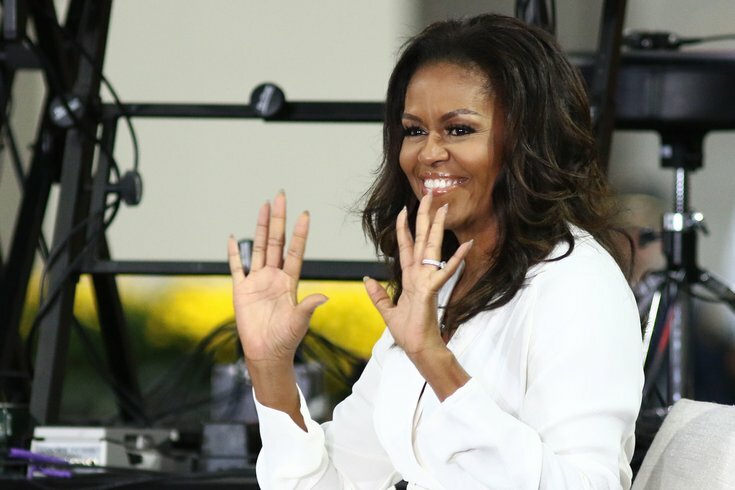 The Roots drummer created the playlists, titled "The Michelle Obama Musiaqualogy," to coincide with Obama's ongoing book tour, which stops in Philadelphia next week. The curated selections have been playing as warm-up music in venues since the tour kicked off in Chicago on Nov. 13. Each playlist is divided into eras in the life of Obama. The first volume, "1964-1979," features the likes of John Coltrane, Ella Fitzgerald, Stevie Wonder, The Jackson 5, and many others for the 100-song set. It clocks in at just under 13 hours. Next is the "1980-1987" playlist, with music from Diana Ross, Queen, Chaka Khan, Prince, Grace Jones, Aretha Franklin, Hall & Oates, and others for another 100-track playlist. The third installment, "1988-2018," is heavy in hip-hop and pop, with Notorious B.I.G., Missy Elliott, Destiny's Child, Will Smith, TLC, Lauryn Hill, Justin Timberlake, and lots of Erykah Badu. "Like a lot of people, I connect many of my memories with the songs and melodies I was listening to at the time," Obama told Billboard. "From the jazz and Stevie Wonder of my childhood, to Prince and Earth, Wind & Fire as I came into my own as an adult, to Beyoncé, Janelle Monáe, and so many others who provided the stirring backbeats of my time in the White House – music has always been a defining part of who I've become." If you won't have the chance to hear the music playing in person during Obama's Wells Fargo appearance, fear not: All three lists are available on Spotify and on Questlove's Pandora station. Take a look at the first collection below.